A life-like robot capable of drawing portraits from real life, Ai-Da is an artist and a work of art. Ai-Da ‘sees’ through a camera in her eye and responds without human intervention, isolating her subject from the background, interpreting it and drawing it by hand. Her preferred medium is pencil or ink (and her creators hope she’ll soon be able to paint as well). Meller began considering the idea of an AI artist while playing with Lego with his 11-year-old son. “There I was, holding a machine in my hand, and it made me wonder if it was possible for them to be creative,” he says. Ai-Da, named after computer programmer Ada Lovelace, is the result. Ai-Da doesn’t just draw – she’s also a performance artist. 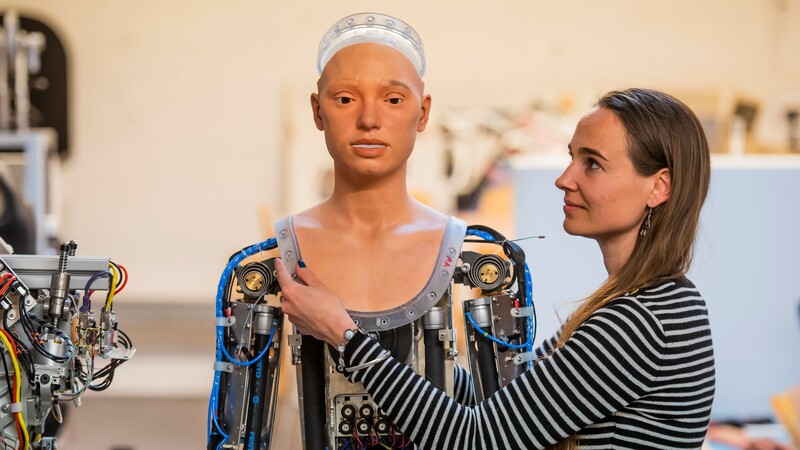 Her body was built by UK-based robotics company Engineered Arts, using the company’s expressive RoboThespian robot body, which is specifically designed for performances in public spaces. 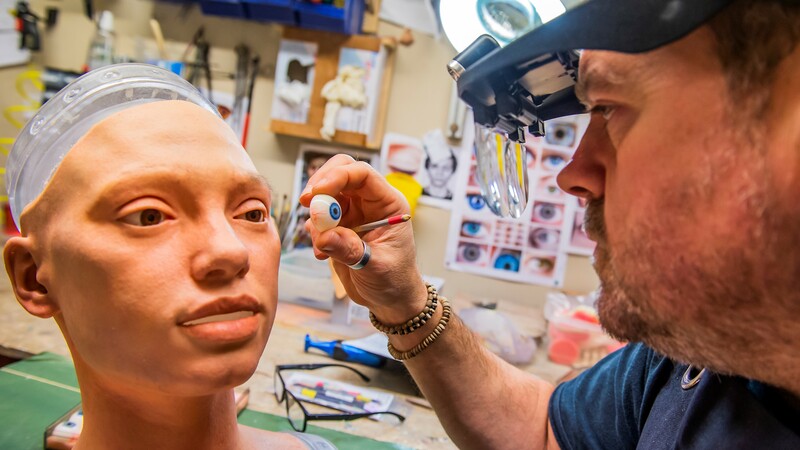 Her Mesmer head is finished with silicone skin, 3D-printed teeth and gums, and integrated eye cameras. The seven-month build was an intense process – and an expensive one. Meller put his own money into the project, but it was also funded by pre-selling art for her first show, Unsecured Futures. “We’ve sold over £1 million worth of artwork,” Meller says. “There were 10 people at Engineered Arts, 15 people programming the AI for creating art at Oxford University and Goldsmith’s College in London, and two people at the University of Leeds doing the arm,” says Meller. Ai-Da’s first exhibition will launch on May 9, but first she’ll take to the stage at Oxford University to give her own press conference – responding to questions and interacting with the audience. Ai-Da will also perform an homage to Yoko Ono. The aim is to highlight how little we understand the AI systems we’re coming to rely on, which are often black boxes. “We want to push the boundaries of what AI can do,” says Meller. “We’re using her to question how we are using AI today – are we just using it for profit, where it can have a damaging impact on humans and lower the quality of life for animals, for example, or are we using it for good?"